Love the tale of Peter Pan? Peter and the Lost Boys by Push Gaming pays homage to J M Barrie’s popular story with a fun and enticing slot, set in an enchanted forest. Could Tinkerbell spread a little magic your way in this real money slot? You’d better get spinning those wheels to find out! Peter and the Lost Boys takes you on a special trip to Neverland, where the reel gaming action set around the theme of an enchanted forest. The 25-line, 5-reel game features three symbols per reel and quaint the symbols are two! Dressed in a range of entertaining costumes, Peter Pan’s Lost Boys have clearly not grown up yet!. The slot is very visually appealing and Push Gaming has done a great job in the development of it. If you’d like to give it a whirl, then the free demo feature is excellent, as you can see how the gaming works – and potentially how the bonus features work – before committing yourself to play. The graphics in this game are top notch. 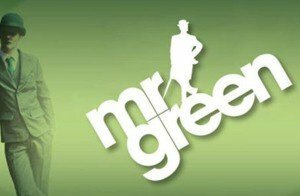 An awful lot of work and planning as been put into producing an online gaming slot that not only looks good but is great to play too. The graphics successfully transport you to a forest – there are trees, vines and exotic looking flowers in the background. The reels themselves rest on the backdrop of trees – spot the bark effects behind the symbols! Regarding playability, it’s an online slot that’s easy to get the hang of, especially if you read through the instructions or try the demo before you play for real. 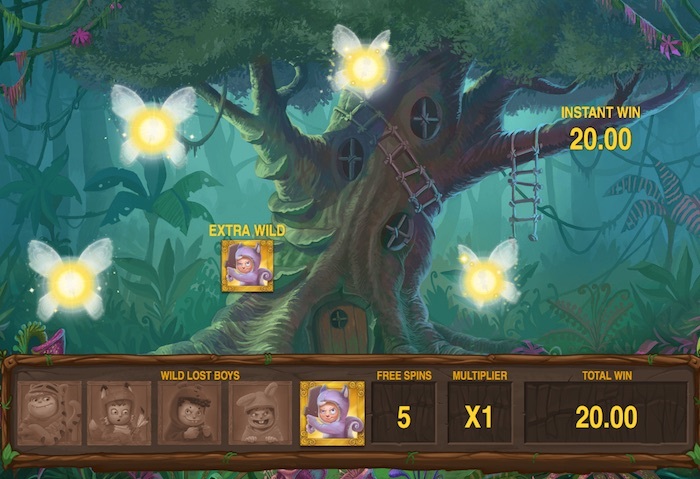 Peter Pan and the Lost Boys features a range of symbols across the game. Peter Pan, the boy himself, acts as the Wild symbol – he’s shown in green. Scoring three Wilds will result in 20x your bet, four gets 120x and five a massive 500x your bet. Peter’s band of jolly comrades are the five characters dressed up in animal costumes. Their payrates are next in line, with amounts varying from 15x for three symbols, up to 500x for five. As ever, the usual slot symbols of A, K, Q, J and 10 appear too, with the A symbol scoring higher and the 10 the lowest. There’s a scatter symbol in the game too. You will see this as an ornate gold mirror, or picture frame. If you get three instances of the scatter symbol on reels one, three and five, then the Pick a Fairy Free Spins feature will be triggered. You’ll know when this happens, as the empty frame is suddenly alive with fairy wings (they look a bit like butterflies). The Payout Table on the game provides a full run down of all of the symbols, the all-important winning lines and how much you could win. Of course, it depends in part on how much you’re betting in the first place. Here at Slotsquad, we’re rather fond of mobile gaming slots that have lots of extra features. Thankfully, Peter and the Lost Boys don’t disappoint on that level. The Linking Wilds feature is triggered when you get two or more Wild symbols appearing on screen. Before your eyes, the Wilds magically link together – any non-wild symbols that appear along the linked path automatically transform into Wild symbols. Any single award type can be revealed up to five times. A multiplier of up to 10X is possible, or you could win up to 25 extra free spins and five extra wild symbols. As you can tell just from reading this, the potential to win big during the Pick a Fairy Free Spins feature is big! When it comes to betting, Peter and the Lost Boys caters for a range of betting budgets. At the lowest end, bets start at just 25p, rising to a high of £25. Your balance and winnings are always clearly displayed at the bottom of the screen, so you can increase or lower your bet level whenever you choose. The return to player (RTP) rate of the game is 96.53%. 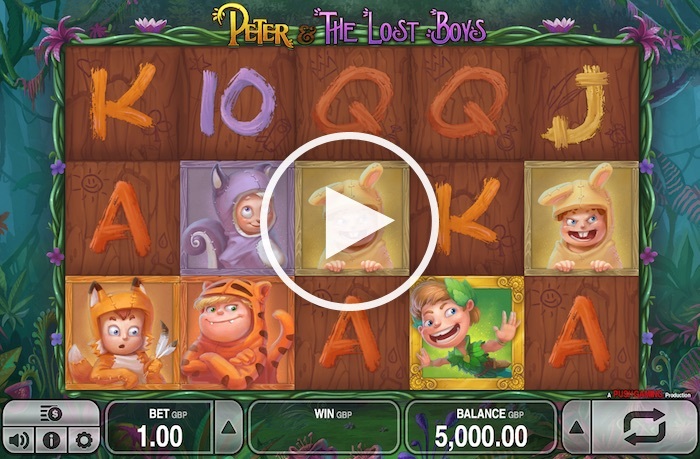 To summarise, Push Gaming has done a great job in the design and creation of the Peter and the Lost Boys online slot. The games are nicely orchestrated, beautifully designed and compelling to play. The bonus features help the action come to life and, with a good winning potential, it’s well worth giving this game a go if you love to play slots for real money.